AUSTIN/SCHERTZ, Texas – A package bomb blew up at a FedEx distribution center near San Antonio on Tuesday, the fifth in a series of attacks that have rocked Texas this month and left baffled investigators searching for what they suspect is a serial bomber or bombers. The Austin Police Department confirmed today that this explosion is connected to the previous four package explosions in Austin earlier this month. The latest explosive package, filled with nails and metal shrapnel, was mailed from Austin to another address in Austin and passed through a sorting center in Schertz, about 65 miles away, when it exploded on a conveyer belt, knocking a female employee off her feet, officials said. She suffered minor injuries. The five explosions over the past 18 days have killed two people and left five injured. Hundreds of federal and local investigators are scrambling to identify a perpetrator or a motive. FedEx announced that it had discovered a sixth package — containing explosive material — that they believe is from “the individual responsible” for the San Antonio explosion. They have handed the package over to law enforcement, FedEx Corp said in a statement on Tuesday. FedEx did not give further details on the sixth package, but a FedEx employee with knowledge of the incident said the box had been tracked to a south Austin facility. The facility was evacuated, said the employee, who asked for anonymity because he was not authorized to discuss the matter. Police have also confirmed that the sixth package is linked with the other package bombings in Austin. Speaking through the media, officials have appealed to those responsible for the bombings to reveal their motive for the attacks. They have also asked the public for any tips, offering a $115,000 reward for information leading to the arrest and conviction of the culprit(s). Investigators are trying to work out a motive for the bombings and identity of the bomber or bombers, a U.S. security official and a law enforcement official told Reuters. The FBI is now investigating the FedEx package explosion on the assumption of a connection to the Austin bombings, the law enforcement official said. 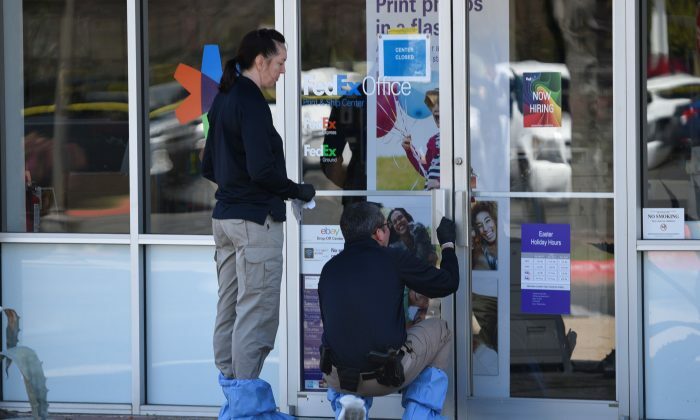 Security experts said the recovery of the second FedEx package and the attacker’s use of a commercial parcel service could give investigators important clues. But if it did contain an unexploded device, that “will be of great forensic value, then you will be able to tell unequivocally the construction techniques that are used,” said Danny Defenbaugh, a Texas-based security consultant who worked for the FBI for 33 years. U.S. House Homeland Security Committee Chairman Michael McCaul told the Associated Press that investigators have also obtained survellience footage that may “possibly” help identify a suspect from the San Antonio FedEx bombing. President Trump has sent 500 federal agents to join the investigation. The FBI and the Bureau of Alcohol, Tobacco, Firearms and Explosives (ATF) are among those working with local officials in Austin, Schertz and San Antonio. Austin police tweeted some guidelines for the public, reminding residents to stay vigilant and look out for each other’s safety.